Products and services that let users share information across their mobile and desktop PCs are likely to increase in popularity. Most (81%) mobile PC users have recently used two or more PCs, revealing the contrast in their behaviors between being untethered to any particular computer, yet tethered to computers in general. 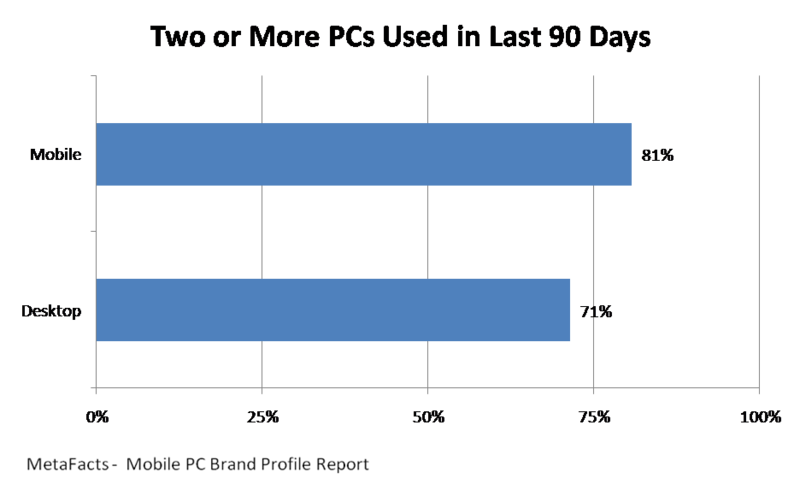 A large number of desktop users also use multiple PCs, although at 71% are not quite as numerous. MetaFacts releases ongoing research on the market shifts and profiles for Windows Vista, Mobile PCs, Workplace PCs, Home PCs, Moms and Dads, Web Creators, Broadband, and many other technology industry topics. These Profile Reports are in a series on specific topics utilizing the Technology User Profile Annual Edition study, which reveals the changing patterns of technology adoption and use in American households and businesses. Interested technology professionals can sign up at www.metafacts.com for complimentary TUPdates, periodic snapshots of technology markets.